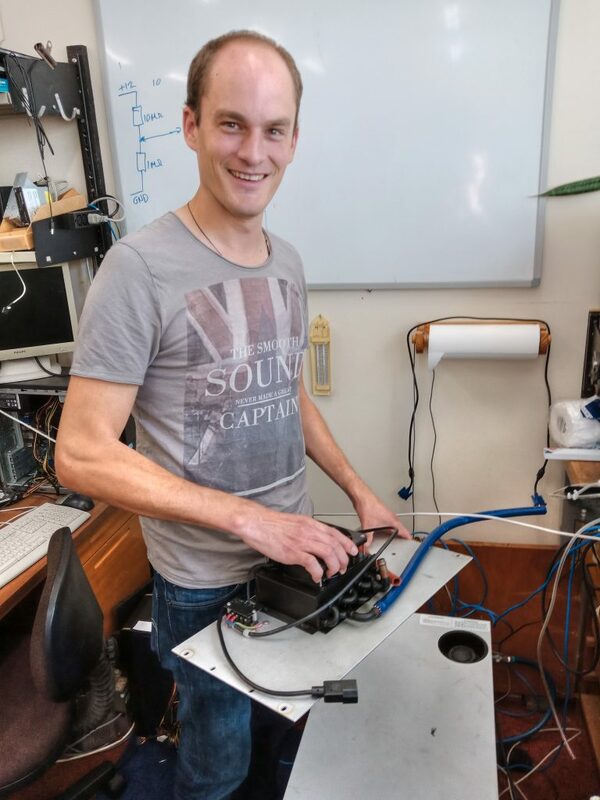 Max working at the climate-control box ‘GeoMIC’ at the University of Waikato. 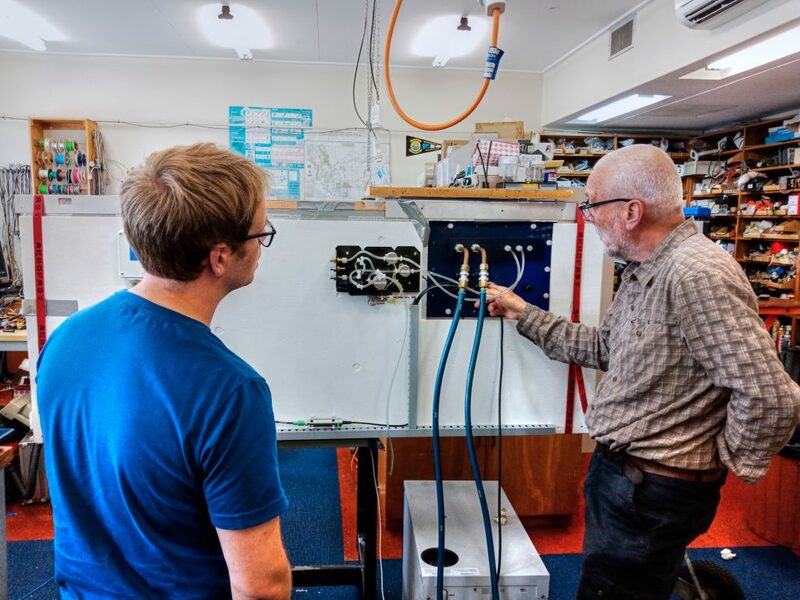 The development of a climate-control box at the University of Waikato (based on the prototype at JGU, Mainz) has made significant progress. This box, christened ‘GeoMIC’ (Geochemistry, Mineralogy, Isotopes and Climate), is a state-of-the-art climate-control box designed to provide QUEST researchers with a chamber of strictly-controlled atmosphere in which a wide range of laboratory experiments in geochemistry, mineralogy and climate science can be run. The box has been designed and constructed primarily by Dr. Adam Hartland and two technicians, in collaboration with Max Hansen (JGU) who spent a month visiting the University of Waikato in mid-2018. Max provided useful insights and advice during the construction of GeoMIC and the design of the first experiments to be run within the box. GeoMIC will be used primarily for calcite growth experiments, with the atmosphere inside the chamber closely mimicking natural cave conditions. It has been constructed to ensure its suitability for experiments requiring trace element and isotopic analyses. GeoMIC has the potential for stable C and O isotope experiments to be run in the future. GeoMIC has been equipped with a 4-channel high-precision Heidolf peristaltic pump, high sensitivity Vaisala probes for humidity, temperature and CO2, and an entry port for two separate gases. Manual manipulation of an experiment after the chamber has been sealed to the outside environment can be achieved through four nitrile isolator-box gloves installed on the face of the box, designed for increased dexterity. Perhaps the most impressive feature of GeoMIC is the purpose-built Labview software program that provides automatic control of the CO2, humidity and temperature within the chamber. The software ensures these parameters are kept at the user-specified values, as well as logging all atmospheric data for the duration of the experiment. This software also controls the peristaltic pump, so that changes in flow rate throughout an experiment can be achieved without manual intervention. Sequences specifying changes in temperature, humidity, flow rate and CO2 concentrations at set times throughout the experiment can be executed automatically using the software, and remote access to the GeoMIC computer ensures that the box atmosphere and the flow rates can be monitored and adjusted from anywhere in the world. This software represents a major improvement in the climate-control box system, as researchers will be required to spend significantly less time checking on and manually adjusting the environmental parameters. Importantly, the fluctuations in these parameters are also significantly smaller than when controlled manually, therefore a more constant environment is maintained. 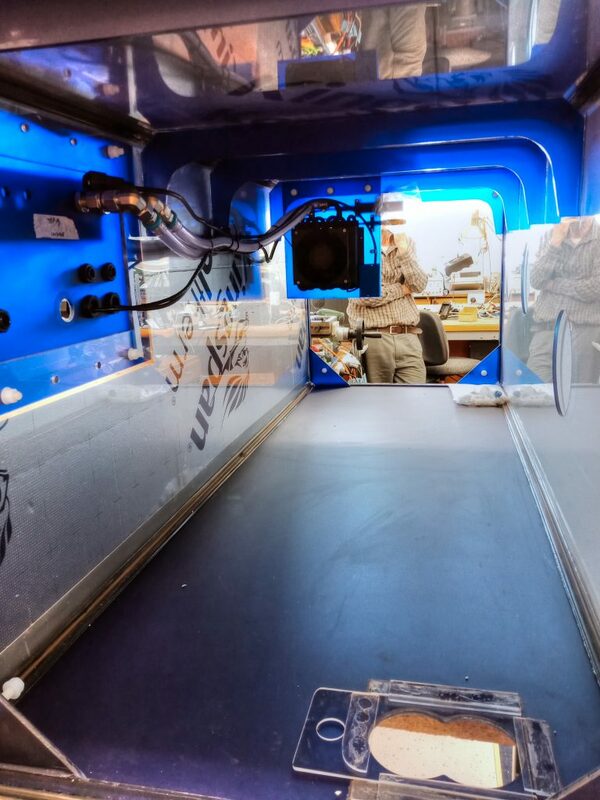 Inside the climate-control box ‘GeoMIC’. GeoMIC is expected to be fully completed in February 2019, and several calcite growth experiments have already been designed to run upon completion of the system. These experiments allow the growth of calcite in a cave-analogue environment, and will provide valuable information about partitioning and fractionation of trace elements inside speleothems. The effects of the coordination of Cu, Co and Ni to organic ligands in cave dripwater will also be assessed. These experiments will potentially aid in the development of new trace element paleoclimate proxies for speleothem analysis.